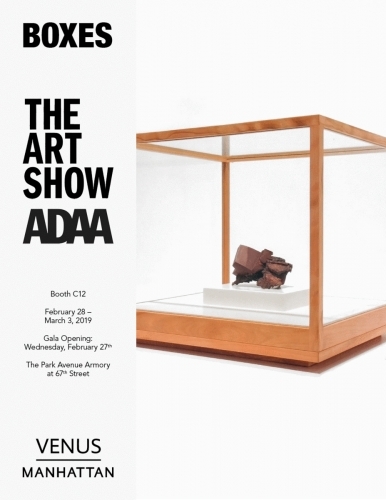 (New York, NY) – Venus Over Manhattan is pleased to announce its participation in the 2019 edition of The Art Show at the Park Avenue Armory with a presentation dedicated to artist-made boxes. Featuring over twenty objects that engage the format of a box, the presentation marks the gallery’s inaugural presentation as a new member of the ADAA. Spurred in part by the groundbreaking 1964 exhibition “Boxes,” organized by John Weber and Walter Hopps at the Dwan Gallery in Los Angeles, Venus Over Manhattan’s presentation enlists a wide range of artists to survey the tremendous variety of approaches to the format of a box. Comprising important and historic examples by Joseph Cornell, George Herms, and Louise Nevelson, the presentation highlights the form’s early association with assemblage and collage, methods championed by artists associated with Surrealism, Dada, and Funk. Functioning variously as shadow boxes, vitrines, or armatures for three-dimensional compositions, these works recall the logic of the wunderkammer, or cabinets of curiosity, on a diminutive scale. Lucas Samaras – perhaps the foremost practitioner associated with the box – along with Judith Bernstein, bring unexpected materials to the form to produce objects of intense curiosity. Represented by two works from the 1970s, Samaras forged a practice that focused sustained attention on the box, encrusting his works with pins, stones, and paint to produce visually complex objects that suggest complicated psychological themes. 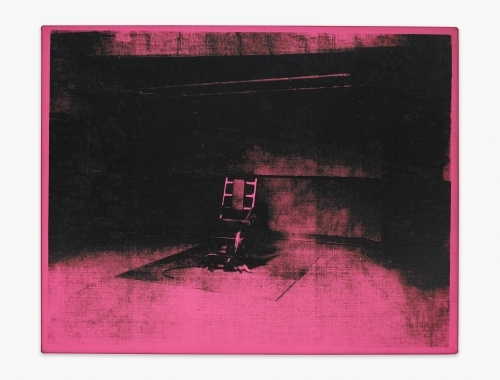 Exhibited for the first time in “Boxes” at the Dwan Gallery, Andy Warhol’s screen printed boxes cunningly reproduce cardboard boxes found in supermarkets. Represented by a Tomato Juice Box from 1964, Warhol brought the clarity of Pop Art to the form, fabricating them with a cabinetmaker before printing them with corporate logos. Other artists turned to the box for its rigid geometry; Larry Bell, Tony DeLap, and John McCracken produced work that engaged minimal forms to explore light, space, and reflection. Others still mined the form’s associations with containment and protection; H.C. Westermann made obsessively crafted wooden boxes with elaborate dovetail joinery that held nothing inside, while Ken Price built transparent glazed vitrines to encase his delicately scaled, hand-painted ceramics. 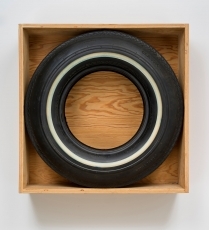 Along with a set of more recent examples, including a boxed tire by John Dogg, and a lenticular light box by Mike Kelley, the presentation attests to the continued relevance of the box format as a generative site of artistic production. 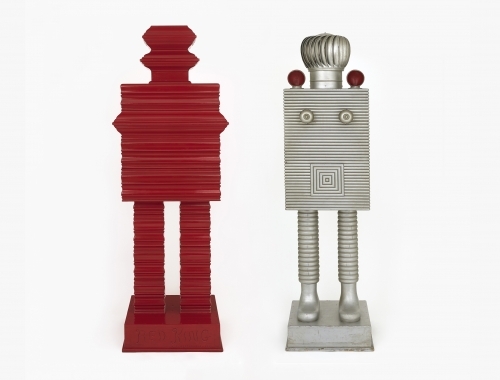 Artists featured in the presentation include: Larry Bell, Judith Bernstein, Joseph Beuys, Joseph Cornell, Tony DeLap, John Dogg, George Herms, Damien Hirst, Mike Kelley, John McCracken, Louise Nevelson, Ken Price, Richard Prince, Lucas Samaras, Saul Steinberg, Andy Warhol, and H.C. Westermann. 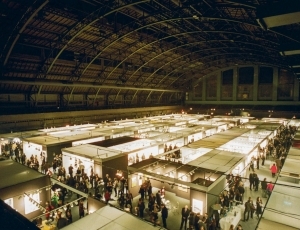 The best thing about the Art Show, the annual fair sponsored by the Art Dealers Association of America in the Park Avenue Armory, is that ticket sales benefit the Henry Street Settlement, which has been bringing art and culture to the Lower East Side since 1893. 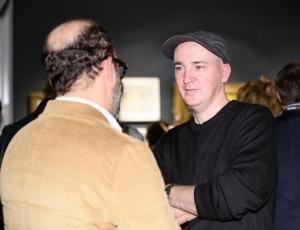 ADAA Art Show 2019 Opens in New York: The Art Dealers Association of America (ADAA)’s annually organized fair opened with a VIP benefit and gala for the Henry Street Settlement on Wednesday evening. The Art Dealers Association of America (ADAA) held its Gala Preview of The Art Show Wednesday night at the Park Avenue Armory. With a new Executive Director and a lighter, airier feel, The Art Show continued its partnership with Henry Street Settlement for the 31st year.